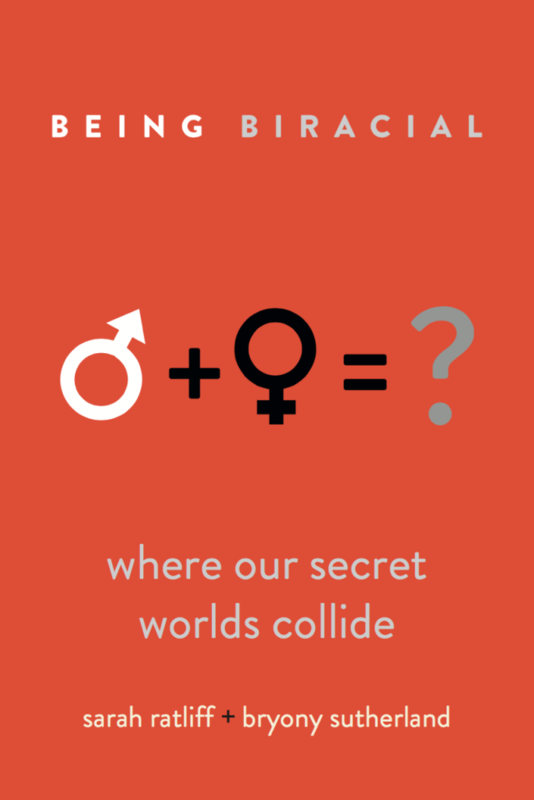 Being Biracial is very pleased to announce the publication of Being Biracial: Where Our Secret Worlds Collide Educators’ Guide. We never anticipated our readership would encompass academics and scholars, but having received a number of messages from professors across the United States, we were encouraged to put together a companion guide for use in classroom discussion, allowing all aspects of our subject some vital air time. This wouldn’t be possible with the writing of mixed race scholar Shannon Luders-Manuel and the mentorship of Professor Alec MacLeod. Being Biracial: Educators’ Guide now brings the topic to the classroom in a bold examination of race, including considered portraits of current gures from the multiracial community and a section of questions relating directly to the essays within the original book, with ample space for note-taking. Students are encouraged to re-examine these issues in new and thought-provoking ways, giving all aspects of the subject some vital air time at a key point in their academic development. The Being Biracial: Educators’ Guide may be purchased on Amazon.com, Barnes & Noble and Powell‘s. Shortly after we started writing Being Biracial: Where Our Secret Worlds Collide in 2014, we came across Mixed Remixed—America’s premier cultural arts festival celebrating stories of the Mixed experience and incorporating multiracial and multicultural families and individuals through films, books and performance. We decided that after our book was published, we would—at the very least—attend the festival in 2016, hoping to build and strengthen ties within the mixed race community. Obviously we are thrilled beyond words to announce this news. The festival is held annually in Los Angeles, California at the Japanese American National Museum. The dates for this year’s festival are June 10 and 11. As a non-profit organization, Mixed Remixed—and in particular their annual festival—is run entirely off donations. If you have charitable dollars left to spend and you’re looking for a worthwhile cause (after all, what could be better than ensuring that programs that promote culture and diversity can continue? ), please consider donating to Mixed Remixed. We are tentatively scheduled for Saturday, June 11 between 11:00 and 11:50 a.m. We’ll post the schedule once it’s published. 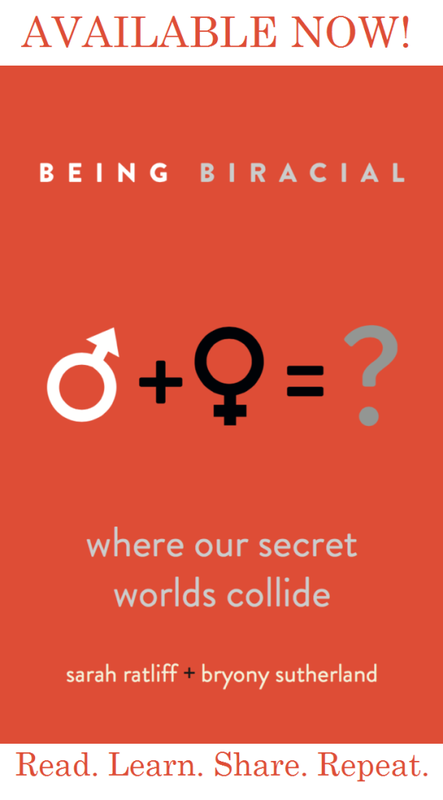 From the moment we began writing Being Biracial: Where Our Secret Worlds Collide, it had always been our intention to partner with a racially appropriate non-profit agency to donate a portion of the proceeds of our book sales. We are pleased to announce that we are co-sponsors of two bone marrow drives, both taking place in November. Each year approximately 30,000 Americans are diagnosed with potentially fatal blood diseases like leukemia, lymphoma and sickle cell anemia. Many of these diseases manifest in childhood, adding an extra dimension of tragedy to the misery they cause. Bone marrow transplants, along with umbilical cord blood transplants, will offer as many as half of those who are fighting these diseases their best chance for recovery. The need for Biracial and Multiracial donors is most acute, but there is a shortage of donors from the African American, Hispanic/Latino and Asian-American communities as well. People have the mistaken belief that donating bone marrow is highly painful, but in fact it is a relatively uncomplicated procedure and is no more harrowing or difficult than donating blood. November 14, from 3:00 to 5:00 p.m. November 21, from 2:00 to 4:00 p.m.
Watchung Booksellers is a vibrant, independent community bookstore located in the heart of Montclair. It is a fierce supporter of the community, contributing to and working with the public and private schools serving Montclair’s children, the Montclair Public Library, Montclair Fund for Educational Excellence, the Adult School of Montclair, and Montclair’s civic, political and religious institutions. Lisa W. Rosenberg is a psychotherapist, writer and speaker specializing on topics related to body image, parenting and identity. She previously was a ballet dancer with the Pennsylvania and Pacific Northwest Ballet Companies. She lives in Montclair with her husband and two children. On Thursday, October 29, 2015 we were interviewed by Edie Weinstein on her weekly radio program, It’s All About Relationships. Just below the Sharing is Caring social media buttons is a little speaker that says “listen.” If you click that you can hear the interview. We should warn you, however, the coquí frogs (present only on Puerto Rico and Hawaii) dominate the first three minutes and thirty seconds (3.30) of the recording. 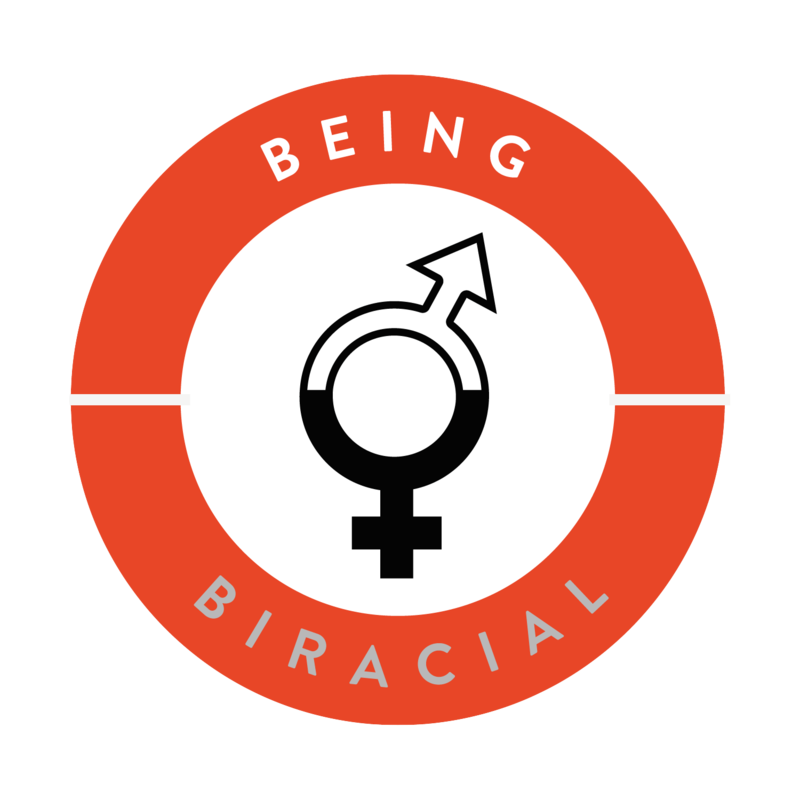 After months of using the hashtag #BeingBiracial in our Tweets, we are very pleased to announce that we have registered the hashtag and we hope you’ll use it liberally. 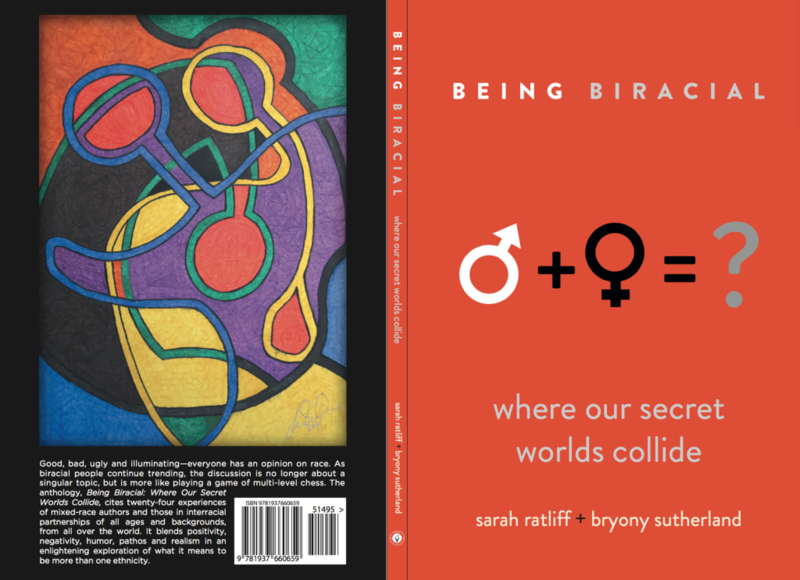 Please come join our Twitter Community at @BeingBiracialSW! Interested in knowing more about the book? 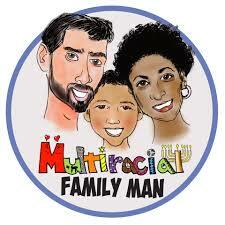 Check out our interview with Comedian Alex Barnett, host of the weekly broadcast Multiracial Family Man. You can listen on iTunes, Libsyn Podcast Network and/or Stitcher. Bryony and Sarah go into great detail about what it’s like to be Biracial, Multiracial and Multiethnic and/or the parents of Biracial, Multiracial and Multiethnic kids. 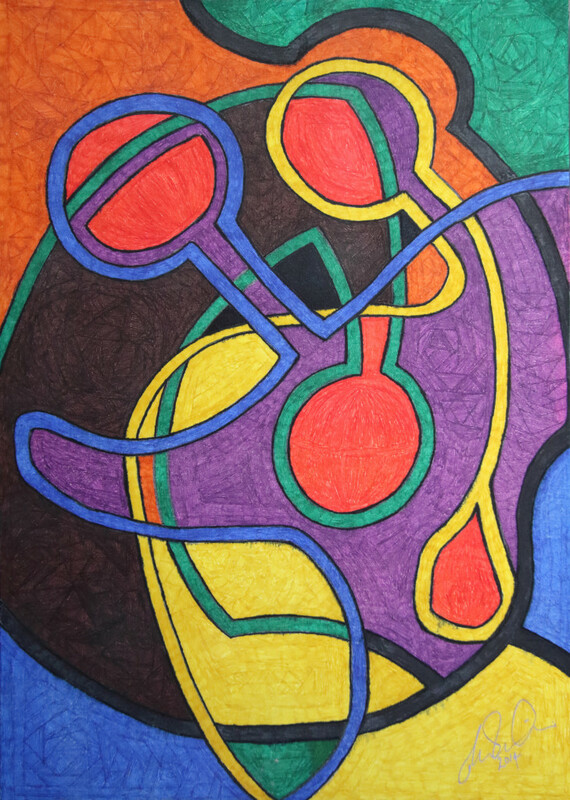 We would like to thank Mark White for not only writing a memorable contribution, but also for donating his artwork for the back cover of Being Biracial: Where Our Secret Worlds Collide. This beautiful picture was sent halfway round the world from Australia to its new home in the UK, where it is already teaching three Biracial boys to analyse and appreciate art with a new eye. Mark’s essay covers the dual meaning of this picture, as explained in his words above. However, for the purposes of this book, green represents the blending of blue and yellow, making the baby in her belly Biracial.